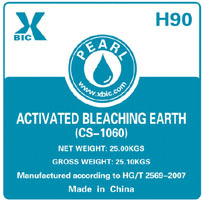 Pearl ® H90 is manufacturered by acid activation of ca-bentonite according to CS-1060 (HG/T 2569: 2007) standard, which is a fine, greyish-white powder showing a highly porous inner structure and a multitude of acid sites upon its surface. Pearl ® H90 is a highly active bleaching earth used in wide scope of applications, which is well suitable for refining vegetable and animal oils and fats, moreover for finishing and/or reproCessing numerous types of mineral oils, praffins and waxes. All data mentioned in this leaflet are typical for this product and based on average values. Certain deviations can appear due to the proCessing of natural clays as a raw material. In no case are these values to be regarded as specifications. On request, certificates of analysis according to CS-1060 (HG/T 2569: 2007) standard for specified values of single properties can be agreed upon.